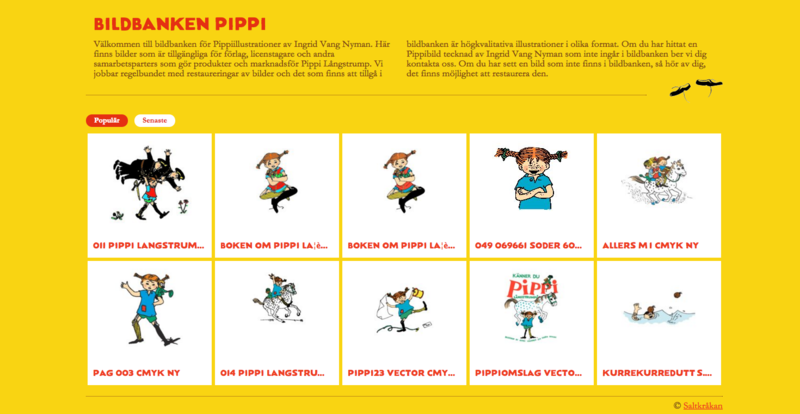 As a service to their partners, the Astrid Lindgren Company provides them with protected material, such as images, logotypes and other material that often tend to consist of large files. Previously this was done with the help of various internet applications. This process granted The Astrid Lindgren Company to have complete control over who had access to its assets, however it was very time consuming. They needed a system to share assets with licensed users in a fashion that's efficient for all, without losing control over who had access to what material. The Astrid Lindgren Company's mission is to protect and promote the trademark of Astrid Lindgren, worldwide. Astrid Lindgren, the famous storyteller and creator of iconic characters such as Pippi Longstocking, Ronia and Karlsson on the Roof. The Astrid Lindgren Company's activities are built on a true love of Astrid Lindgren and her works. This love is something that they want to spread and share with as many children and grown-ups as possible in the future. Their desire is that future developments take place in a way that guards and protects the originality and feel of Astrid Lindgren’s work.